John DiGravio ’21 worked with young baseball players in Hanoi, Vietnam on basic fielding techniques and team cohesion. Photo courtesy of Sports Information. There are no umpires or fences in sight, and instead of leather baseballs, dimpled rubber balls are tossed around the dirt field. 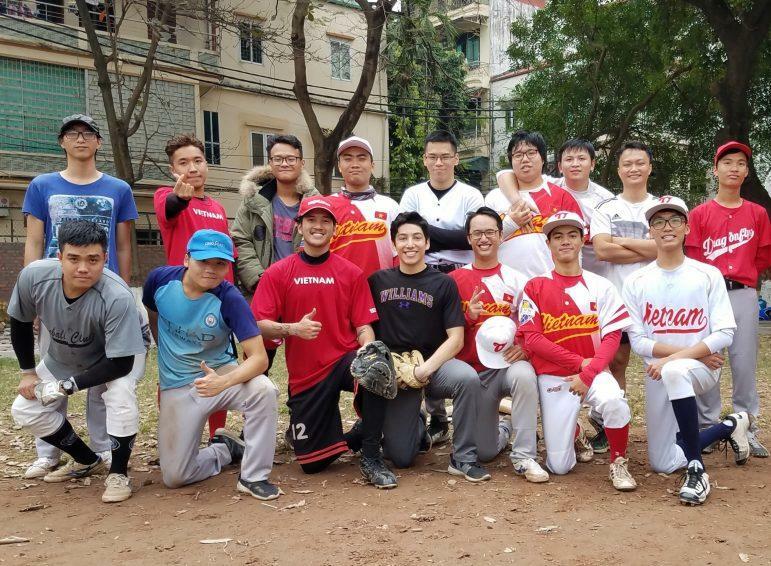 John DiGravio ’21, a utility player on the baseball team, is spending his Winter Study in Hanoi, Vietnam. As part of the political science course “Fieldwork in Public Affairs and Private Non-Profits,” he is volunteering with Bedrock Educational Consultants to provide academic mentoring to Vietnamese high school students. Though unable to train and practice with the rest of his team in Williamstown, DiGravio contacted two Vietnamese teams, the Fishanu and Merlins Baseball Clubs, through Facebook and offered to help coach them. “I actually had no idea that baseball was played in Vietnam,” DiGravio said. DiGravio explained that, while not as popular as well-established sports like soccer and badminton, baseball “has a small but enthusiastic following.” Most Vietnamese fans support Major League Baseball (MLB) teams like the Boston Red Sox, New York Yankees and Los Angeles Dodgers. Vietnamese-American MLB player Tommy Pham, an outfielder for the Tampa Bay Rays, is also a fan favorite. In addition to prioritizing the development of basic fielding techniques and team cohesion, DiGravio relayed the teams’ hopes to increase baseball’s popularity by representing the country in international tournaments and introducing the sport to Vietnamese youth. Besides enjoying the warmer weather, DiGravio identified a unique opportunity: to be able to make new friends who, despite being from a geographically-distant region, share the same interests, from music to baseball. DiGravio also expressed appreciation for the chance to apply his academic interests in history, anthropology and sociology outside the classroom to supplement his liberal arts education. In addition, DiGravio has found that the experience has had value for his own baseball career. He mentioned that, amidst the challenges of being a student-athlete at the College, he sometimes fell into the habit of treating the sport like a chore. DiGravio expressed excitement for the progress of Vietnamese baseball. “Coaching these players was one of the most rewarding athletic experiences of my life, and I’m looking forward to the bright future of baseball in Vietnam,” he said.